As Christmas is only just round the corner, I like to give presents of the homemade kind. This year, I was thinking of gifts of cherries. To herald the plump red cherries coming into season, the first box of cherries for 2015 sold for $65,000 raising money for Save our Sons and the Sydney Markets Foundation. With cherries on my mind, I wanted to try pickling cherries. Having read that these are great served with pate, duck or pork rillettes, terrines, hams and pickled pork, all of which will probably be part of the Christmas feast this year. I'm planning to make my mandarin jam basted ham with pickled cherries on the side. Drooling just thinking about this. 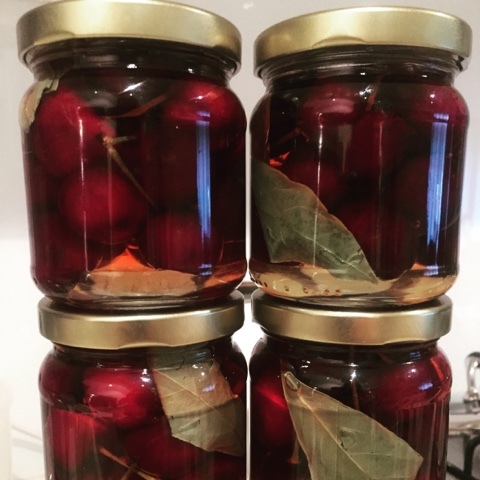 Following Maggie Beer's recipe for pickled cherries, I can't wait to try these on Christmas Day. Makes 1kg jar or 5x200mL. 1. Boil all the ingredients except for the cherries in a stainless steel saucepan for 10 minutes, then leave to cool completely. 2. Meanwhile, wash and dry the cherries thoroughly discarding any that are bruised or marked. 3. Trim the stalks to 1cm long. then pack the fruit into a sterilised 1 Litre preserving jar. 4. Pour the cold syrup over the cherries, then seal and store for at least a month. (Maggie uses her after 6 weeks but states that they will keep indefinitely). I may used fresh dark cherries instead of Morello and skipped the step in regards to trimming the stalks to 1cm as I wanted to keep intact the stems that were on already on the cherries. As these pickled cherries were going to be given as gifts, I packed the cherries into 7x200mL glass jars. 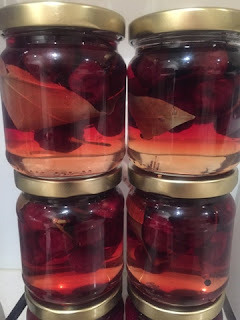 I also added a bay leaf in each jar for a little Christmas green to go with the red cherries. However after a day or two, the cherries started to float to the surface. 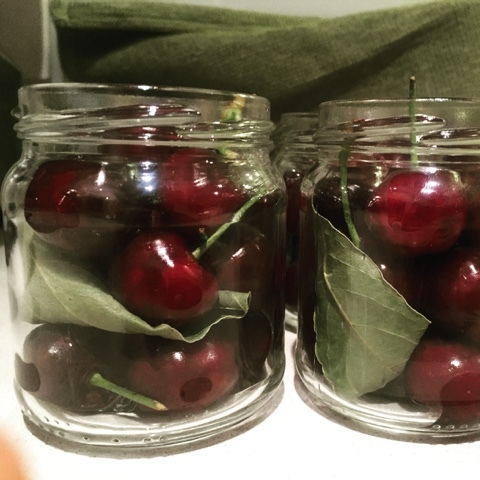 In light of this, I waited a couple of days and repacked cherries into 5x200mL sterilised glass jars. I also had a taste test of 3 day old cherries in the pickling syrup and it has notes of sweet and savoury. I think it will be a hit with the ham, will keep you posted. I'll leave you on a few interesting facts about cherries. You'll want to make sure you're never low on cherries again. Nutritional Facts of Cherries Cherries are a source of potassium, manganese, magnesium, copper iron, phosphorous, vitamin C, vitamin K, thiamine, riboflavin, vitamin B6 and pantothenic acid. They also contain traces of niacin, folate and vitamin A. One hundred grams of cherries is only 63 calories. Cherries are also a good source of dietary fibre, they are low in saturated fat, cholesterol and sodium. Cherries act as an antioxidant. They can reduce the pain of arthritis, gout, headaches, and can be used for treating bronchitis, asthma and chronic diarrhoea. Cherry juice is helpful for the function of the immune system. Cherries are used for nausea and vomiting, wild cherry bark is an important cough remedy.